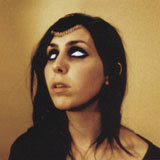 Chelsea Wolfe, it seems, is an odd creature. Projecting a blurred, occult image akin to those of doom stalwarts such as Electric Wizard, Blood Ceremony and the criminally underrated Rose Kemp, she is just as fond of hooded cloaks and ritual headdresses. However, a few spins of her previous effort, The Grime and the Glow, reveal a noisy indie-rock chanteuse with a penchant for murky production values and jarring, folksy guitar ceremonials. Though her morbidity on that disc is present, I found myself a little distrustful of her combination of doom imagery and creepy noise-rock. And yet, I couldn’t quite put my finger on why. Perhaps it was the way she seemed all too reliant on 4-track production to drive much of the atmosphere. However, Apokalypsis is a different matter. Though opener Primal/Carnal is somewhat deceptive – a horrific, static-laden snarl from another plane – the record shows Wolfe to be a force of nature, though not quite in the way you’d imagine. Simultaneously twisted and tender, the record plays like some gothic, noise-folk nightmare waltz, with doom-laden overtones and evanescent nods to trip-hop, industrial and perhaps even the faintest hint of black metal (and if you don’t believe me, check out her mean cover of old-school Burzum floating around on YouTube). But she ain’t no growler. ‘Mer’ truly kicks off proceedings, cementing an energetic shuffle to a hypnotic, fuzzy guitar line. The lo-fi production remains, but has been toned down significantly, allowing more space for the songs and their textures to breathe. Electronic sounds percolate continuously through the record, alongside guitars that often take on a doomlike resonance, particularly in the latter half. It is frequently her choice of sounds and samples, as well as the guitars, that so strongly forge Apokalypsis’ forbidding tone. Underpinning all of this is Wolfe’s voice: sweet, yearning and somehow powerfully mesmerising all at once. Highlights are the slow-burning ‘Movie Screen’ and ‘Pale on Pale’. While the former grows from an a-cappella vocal over stuttering samples into a full crescendo of keening voices and screeching guitar, the latter is as close to doom as Wolfe gets; a sinister dirge, building to its zenith on yet another gorgeous vocal before erupting into a chilling commotion of tormented screams and feedback. ‘To the Forest, Towards the Sea’ provides an ethereal outro, summoning an image of a horde of rats beneath a pier, chewing on a dying siren. In the final seconds, Wolfe imparts some eerie departing words that are perhaps a little too blatant in light of ‘Primal/Carnal’. However, this is only a minor irritation, and the hairs on the back of your neck stay standing for a good while after the disc ceases to spin. Thus, as strange a beast as it is, Apokalypsis is certainly an impressive transmutation of sounds, charged simultaneously with menace and a jarring beauty. Those seeking monolithic metal and huge riffs best look away now, but if you’re interested to hear a heavier, more atmospheric take on end-of-the-world folk, clap your ears on this.